So Mike and I participated in an awesome fundraiser this Saturday. 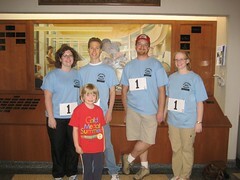 The Rochester Public Library Foundation organized an "Amuzing Race" (based on the tv show, The Amazing Race, of which we are big fans). We were in a team of four with my good friend Lora and her brother Lance. The organization and efficiency of the race was unbelievable. We raced around Rochester from location to location collecting clues and completing challenges. We built a birdhouse, did orienteering in the woods, caught fly balls while attached to teammates, flew paper airplanes, seached VIN numbers on a car dealership lot, and had a WHOLE lot of fun! We unfortunately didn't win the race, which was likely due to a large number of things that slowed us down, including Mike taking a fly ball in the stomach (OUCH!). We did come in 19th place out of 35 teams and we are already strategizing next year's race!! We once again visited the German American Institute in St. Paul which hosted a Sommerfest on their grounds on Sunday. Some of the Schmitt clan met us out there for German food and drink. Uncle Andy and Jennifer took Benjamin on a horse-drawn carriage ride, which he really enjoyed. We all had a great time sitting outside on a beautiful day, listening to the German bands!